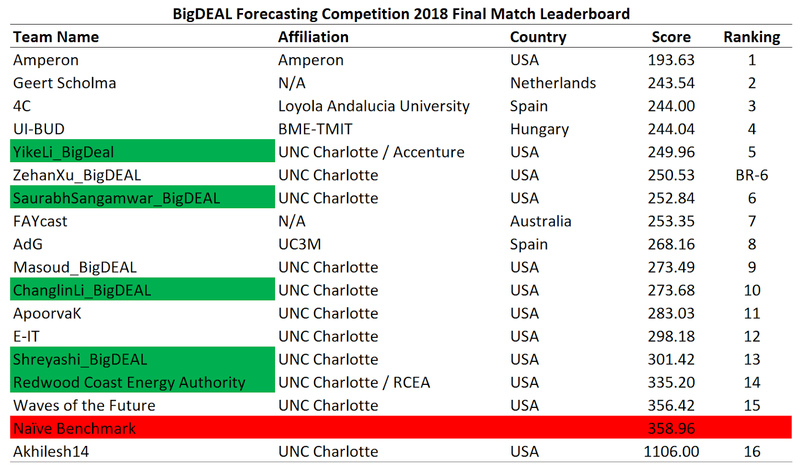 Energy Forecasting: Leaderboard for BFCom2018 Final Match!!! 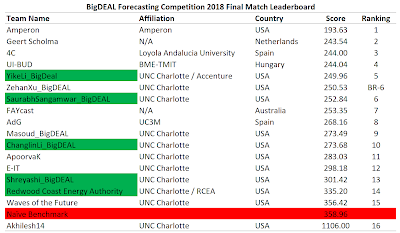 The figure below shows the leaderboard for BFCom2018 Qualifying Match. The green highlighted ones are in-class students. I also created a naive forecast, which is highlighted in red. One of my students Zehan Xu, who was auditing the class but got disqualified in the qualifying match, also worked on the final problem and submitted his forecast on time. I included his score on the leaderboard, but marked his ranking as "BR-6", which means bragging right for ranking #6. His ranking does not affect the rankings of the other teams. Congratulations to all the BFCom2018 finalists for completing this competition! To get updates about the follow-up events, please follow my twitter and/or connect to me on LinkedIn.